If you’ve ever been to Porto, you’re familiar with the ubiquitous Francesinha, the equivalent of a heart-attack on a plate. Its signature is the protein-carbohydrate medley of cured ham, linguiça, fresh sausage, and steak, stacked between two fat slices of bread smothered in melted cheese and doused in a spicy, and oh so flavorful, tomato and beer sauce. Terrified yet? Don’t be, because the people of Porto have made this their gastronomic Holy Grail! Nowhere can you find a better version. So what’s the history of this sumptuous sandwich on steroids? It’s hotly debated. The most common rendition speaks to Daniel David da Silva, an emigrant to both Belgium and France who returned to Porto in the 1950s, where he adapted the croque-monsieur to Portuguese tastes. As the tale is told, the name “Francesinha” (or little frenchie) was a tribute to the sultry, spicy flair of French women, a stark contrast to the sulky, reserved nature of the Portuguese. When seeking your perfect Francesinha, the key is to find the perfect texture to flavor ratio. To start with, this means sticking to tradition. Despite the various renditions made with lobster, mushrooms or topped with shrimp, I’m a sucker for the real deal. That said, the addition of a fried egg is amazing! 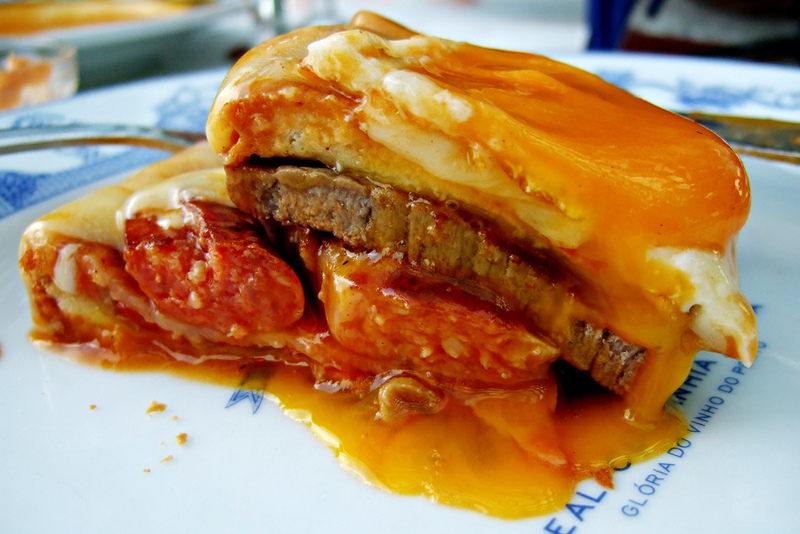 Called the Francesinha Especial, it’s worth trying if your body can take the protein surge! Finally, ensure the beer based sauce is flavorful with a hint of spice. This guarded secret to the Francesinha varies from chef to chef, but the quality cannot be emphasized enough. It’s the make or break to your Francesinha, so seek out the best! Below you’ll find the top 5 destinations in Porto for Francesinha, as recommended by foodie lovers both local and foreign! And to be fair, I expect much debate over this list, because everyone and their mother swears by one specific spot, but I’m willing to take the heat! So bring it on! Long-standing Port wine expert, and diehard Francesinha lover, Roy Hersh has yet to find a better version of this meat lover’s sandwich than what’s offered by chef/owner José Meneses Pinto Filipa at Bufete Fase. “I’ve been eating these sandwiches for more than two decades, and have yet to find better. The sandwich itself uses flavorful ingredients from the meat to the local cheese and the “secret” sauce is very spicy and incredibly satisfying. While I do continue to search for an even greater variety of this Porto creation, I have failed to find any that out-performs the delectable consistency that is produced by José!” Recently, Bufete Fase has expanded into the shop on the corner, next door and the extra seating in addition to the original fourteen, making it more convenient, as their loyal fans line up early and often to get in. According to Rita Branco, lifestyle writer for Oporto Encanta, if you’re looking for a café style restaurant that’s gained a long-standing reputation for insanely delicious Francesinhas, head to Capa Negra. “It’s not only the sandwich itself that needs to be amazing, you need fast service to ensure a freshly made sandwich that’s still hot. Capa Negra offers both!” Amândio Fontes founded his dream location in 1972 and hasn’t stopped whipping up Francesinhas ever since. He’s so passionate that he’s even willing to divulge what’s in his secret sauce!! I won’t give too much away, but I’ll admit that the addition of clove, white wine, and seafood, were surprising! According to Amândio, “This dish requires freshness, a culinary secret the north of Portugal is known for.” But if you want a seat, get there early! Ok, so you won’t find a long list of reviews spouting its fame, but it’s famous for me. This was home to my first Francesinha. Cafe A Cunha was the place that set the standard for what a Francesinha “should” be, and to date, no one has come close. The bread is thick and freshly baked. The sauce is spicy and flavorful. And the meat is…well, addictive! Granted, it’s a bit off the beaten path and packed with locals, but nothing a quick taxi ride couldn’t resolve for around 5 euros. Check it out for yourself! Sr. Silva has been mastering his secret sauce since the opening of this restaurant in 1998. His recipe is so classified that even his wife doesn’t know what goes into it! “The only way I will share the recipe is if I am on my death bed”. Now that’s dedication! According to Andre Apolinário, of Taste Porto Food Tour, there’s no other restaurant in Porto that even comes close to O Golfinho‘s Francesinha, “The down-home feel and passion go into everything they do, and their Francesinha is their crown jewel. Simple, flavorful, using local products, actually beef comes from the butcher across the street! It’s so good!” Yeah, so I’m hungry! Join Catavino to discover the local foods of Portugal!